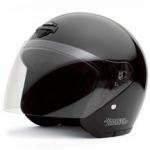 Harley helmets come in many different shapes and styles. Which one to choose? That depends on several factors — what type of rider you are, whether you want the ultimate in safety, and what the rest of your gear looks like. We’ll review a few of the options available so you can sort through the choices and make a good decision. We’re not going to lecture you on helmet safety — you’ve heard that one many times before. Instead, we’ll assume that we all take it as a given that wearing a helmet is a good idea, and instead we’ll focus on the options available. These helmets cover your entire head. Not surprisingly, they offer the ultimate in safety. With a chin bar, face shield and strong outer shell, they’re the right choice for those who like to go fast and don’t mind being separated from the elements. You can find a really slick looking Harley “Ghost Smoke” model in our featured collection. The downside of these helmets is that they’re often very hot, despite cooling channels that are designed to vent air into the helmet. The half helmet is at the other end of the spectrum when it comes to safety. 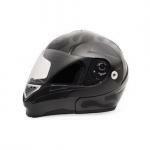 This is for the rider who wants to experience the environment while riding, at the expense of some protection. 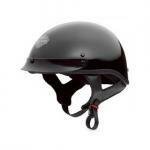 These helmets usually do not cover the entire head and do not fit as snugly on the parts that the do cover. Of course, the traditional Harley styling is available with this type of model. Harley had such great success with their 100th Anniversary marketing, they decided to do it again a few years later. You can find 105th anniversary gear as well as 100th. Helmets are no exception. Look for the traditional bar-and-shield logo alongside some pretty cool looking Anniversary graphics. If you’re looking for vintage Harley helmets, the best place to look is eBay. New models offer retro styling, while used items offer crazy custom paint jobs. Careful with a used model, though, since it may not be up to today’s DOT standards. Those are just a sampling of the Harley helmets styles available. Search around a bit online, and you’ll find yourself inundated with ideas. The safest type of helmet available, this full-face helmet provides extra protection with an extra strong polycarbonate shell. Hardware is aluminum that provides optimal rotation as the chin bar is lifted. This allows for the least amount of torque and lift in the case of impact on the chin.